Because of the recent advancements in automotive engines speed and performance, today’s air conditioning clutches must withstand higher speeds, heavier vibration and extreme temperatures. 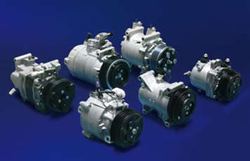 They are also required to fulfill the response needs of the various types of compressors being manufactured worldwide. To respond to these requirements Ogura has incorporated various unique design features into the clutches. 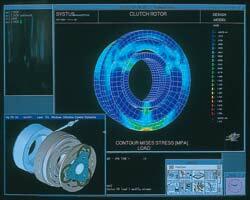 A mechanism to reduce the shock to the compressor shaft,a resonance reducing device and a design that absorbs eccentric loads are all examples of Ogura’s advancement in manufacturing technology. These advancements combined with superior quality and market responsiveness has helped Ogura to earn one-third of the global market share for mobile air conditioning clutches. 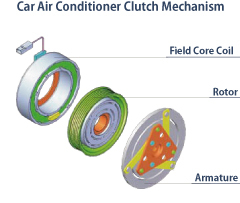 Automotive air conditioning clutches are made up of three major sub assemblies. These are field, rotor and armature. From these basic components a wide variety of designs can be constructed to handle a wide variety of compressor and other automotive on/off applications.